On Tuesday, October 9 from 10:30am to 12:00pm central, Morgan Farms will host shoppers and guests during Tennessee Craft Week to promote local handmade arts and crafts and celebrate the beauty of craftsmanship. Craig will be in the store that morning, creating an artisan item as guests learn more about the wood lathing and carving process. Tours of the building, originally constructed in 1912, will be available including the 2nd floor event space, The Loft at Morgan Farms. Craig will also give an acoustic performance during the daytime event. 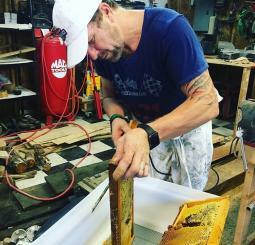 Located in his hometown of Dickson, Tennessee, Morgan Farms creates organic items and products from reclaimed, repurposed, and recycled materials. The Gallery at Morgan Farms features a variety of artisan items handmade by Craig and his family, including one-of-a-kind hand-carved wooden table centerpieces, bowls, spoons, cheese trays, bread boards, serving trays, cutting boards, candle holders and more. Visit The Gallery at Morgan Farms at 134 N. Main St. in downtown Dickson, Tennessee, open Tuesday through Saturdays from 10 a.m. to 6 p.m. or at http://bit.ly/MorganFarms. In 2017 Craig debuted The Gallery at Morgan Farms, a family-owned and operated farm-to-home business in his hometown of Dickson, TN. The store features a variety of artisan items handmade by Craig and his family and shoppers can also order his custom blended Old Tattoo Cabernet Sauvignon, in partnership with Lot18.com.